A couple of friends of mine had been in their Florida home for a week or so and they came home yesterday and brought me some Fresh Gulf Coast Grouper! Now this beats any old T- Shirt! How fresh is it you ask? It was caught Sunday Afternoon and dropped off to me Monday about 6:00 pm, that’s fresh. I froze 5 fillets and kept one out for dinner tonight. Went to the local Kroger and picked up some Gourmet Red Potatoes and fresh Asparagus to go with the Grouper. 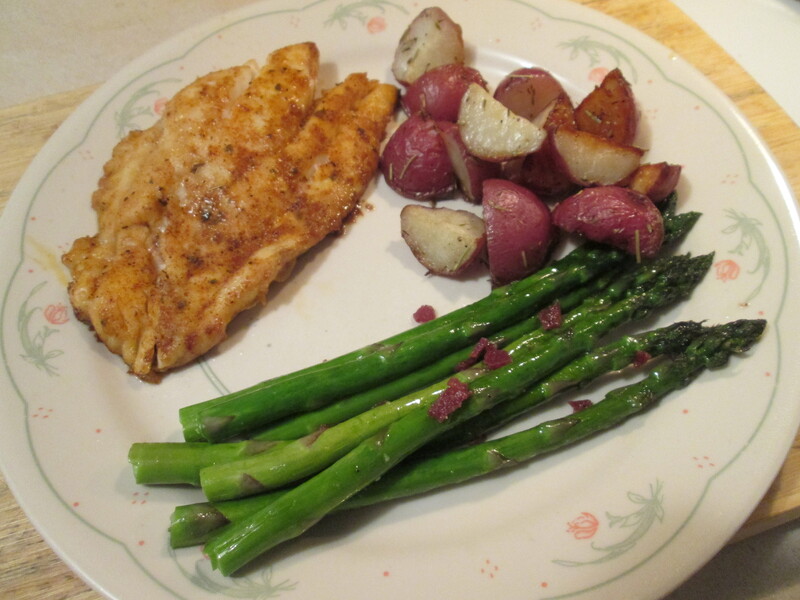 For dinner tonight, Cast Iron Skillet Blackened Grouper w/ Roasted Red Potatoes and Asparagus. I started by rinsing the fillet off with water and patted dry with a paper towel. Melted a tablespoons of Blue Bonnet Light Stick Butter down and rubbed the fillet down with the butter. Then seasoned it with a bit of Sea Salt and then with Zatarain’s Blackened Seasoning, rubbing the Blackened Seasoning on both sides of the fillet until it was well covered. Heated up a Cast Iron Skillet and fried the fillet. Always have your overhead stove fan on when Blackening, it will create the smoke! I fried it about 4 minutes per side. After the smoke cleared the Grouper came out perfect! 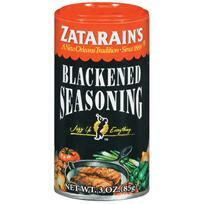 Gulf Coast Grouper by itself is delicious but Blackening it just brings that much more flavor. I’ve said it before, “I could live on Fish”. For one side dish I prepared Roasted Red Potatoes. I quartered and seasoned the Red Potatoes with Dill, Sea Salt, Ground Black Pepper, and Garlic Powder. I used a Cast Iron Skillet that I heated up on medium and added a tablespoon of Extra Virgin Olive Oil. I added the Red Potatoes and fried them for about 7 minutes and then put them in the oven, that was already at 400 degrees, and roasted them for about another 20 minutes until they were fork tender. Excellent way to prepare Red Potatoes! I also made some Quick Skillet Asparagus. Just heat a large nonstick skillet over medium-high heat. Add Canola Oil to pan; swirl to coat. Add the Asparagus to pan; cooked about 3 minutes until the Asparagus was crisp-tender and browned, stirring frequently. To season the Asparagus I added Sea Salt, Ground Black Pepper, Garlic Salt, and Crumbled Turkey Bacon. Delicious meal all centering around the Florida Gulf Coast Grouper, a big thank you to Jim and Linda for the Grouper, and paired with the Red Potatoes and fresh Asparagus. For dessert later a Healthy Choice Chocolate Swirl Frozen Yogurt. Cloudy Outside but Sunny Inside! 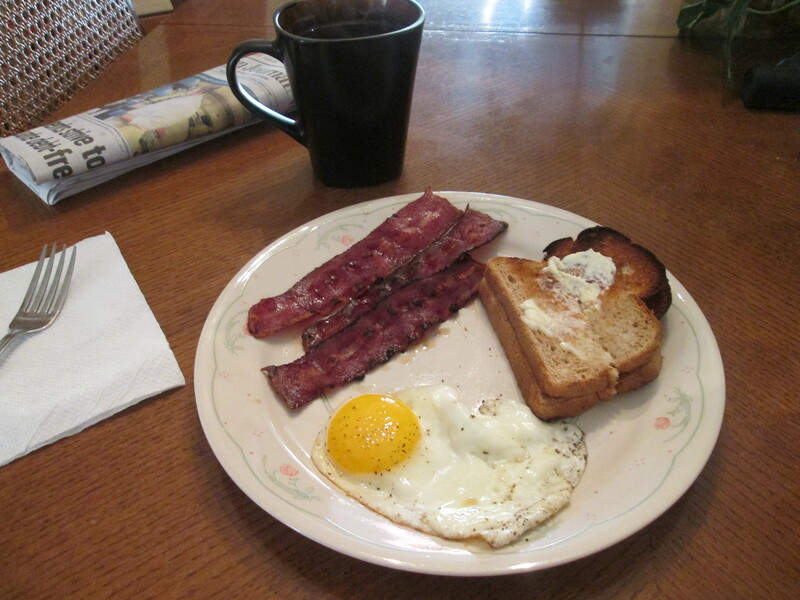 A cloudy and rainy morning outside but it was Sunnyside Up with Turkey Bacon and Toast on the inside. It was gloomy and a slow drizzle of rain early this morning so what better way to brighten it up than a hot and delicious Breakfast! I got the flat top griddle out which I love using. It cooks everything evenly and no oil needed, just a light coat of Pam With Olive Oil. 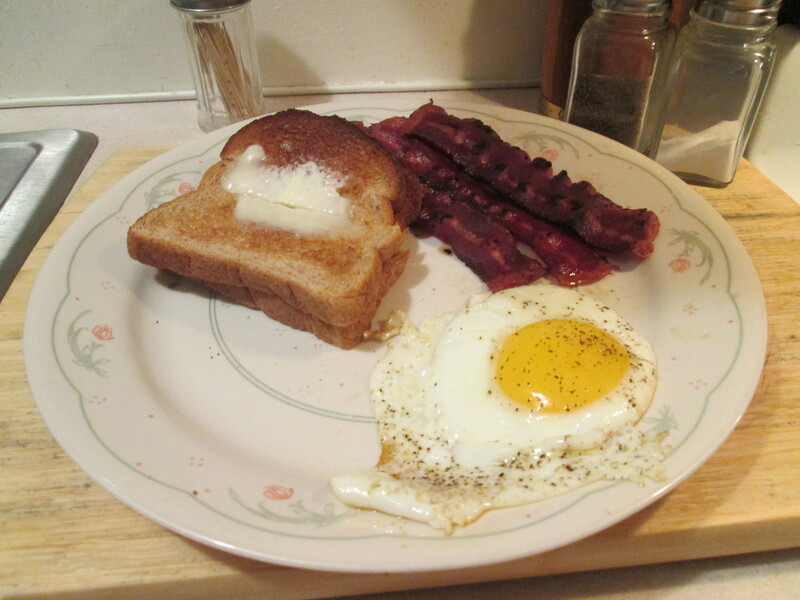 I fried up an 1 Egg Sunnyside Up, 3 slices of Jennie – O Lean Turkey Bacon (30 calories and 0 carbs per slice), and 2 slices of Healthy Life Whole Grain Bread buttered with I Can’t Believe It’s Not Butter. Throw in the Morning Papers and fresh cup of Bigelow Decaf Green Tea and washes away that gloomy day outside. The Sun is breaking out as I’m writing this! A really perfect day out today! It’s about 77 degrees and sunny. Beautiful day but it was a very, very, long night. My parents had made some friends for dinner at a Ponderosa Steak House. they didn’t order from the menu instead chose the Buffet, BIG MISTAKE!! After coming home about an 1 hour or so they both became very sick, Mom worse than my Dad. Upset stomach, nausea and everything that goes with food poisoning. My Mom was so bad I called her family doctor on call service. He said the best cure is to let it run its course, which it eventually did. I won’t go in to detail but I was still doing laundry at 1:00 am. But both are fine now with no after effects. I’m not big on Buffets and that’s the main reason! For dinner tonight I prepared a Bacon Wrapped Turkey Meatloaf w/ Corn on the Cob and Mashed Potatoes. I had prepared Turkey Meatloaf before but not wrapped with Bacon, Low Sodium Turkey Bacon. I had the idea off a cooking show. They said by adding the Bacon it gave your Meatloaf an even better taste. They had used Pork Bacon but I’m using Oscar Mayer Low Sodium Turkey Bacon instead. To make the Meatloaf I’ll need the following; 2 Tablespoons Blue Bonnet Light Stick Butter, 3 Cloves Garlic, Minced, 1 1/4 lbs Jennie O Extra Lean Ground Turkey, 3-4 Slices of uncooked Oscar Mayer Low Sodium Turkey Bacon, 1/2 Cup Progesso Italian Style Breadcrumbs, 1/4 Cup Egg Substitute (Egg Beaters), 1 1/4 Cups Hunt’s Catsup, 4 Tablespoons Worcestershire Sauce, 3 Tablespoons Heinz 57 Sauce, 2 Teaspoons Smoked Cumin, 2 Teaspoons Onion Powder, 2 Teaspoons Ground Thyme, 2 Teaspoons Parsley, 3/4 Teaspoon Sea Salt, and 1/2 Teaspoon Black Pepper. To prepare it start by preheating your oven to 350 degrees. Then melt the butter in a skillet and add the Garlic in melted butter for 5 minutes, stirring occasionally. Place the mixture in a large bowl to cool for 5 minutes. Combine turkey, bread crumbs, egg, 1/4 cup of the catsup, 1 table spoon Worcestershire sauce, spices, and garlic mixture. Press meatloaf into an 8×4-inch loaf pan. Wrap 4 slices of Turkey Bacon over the top and down on to the sides of the meatloaf. Take the remaining catsup and add 3 Tablespoons Worcestershire Sauce and 3 Tablespoons Heinz 57 Sauce, and stir to well mixed. Add as a topping for the meatloaf. Bake in a 350 degree oven for 50-55 minutes or until Internal temperature should reach 165 degrees. Remove from oven and let stand 5 minutes before serving. 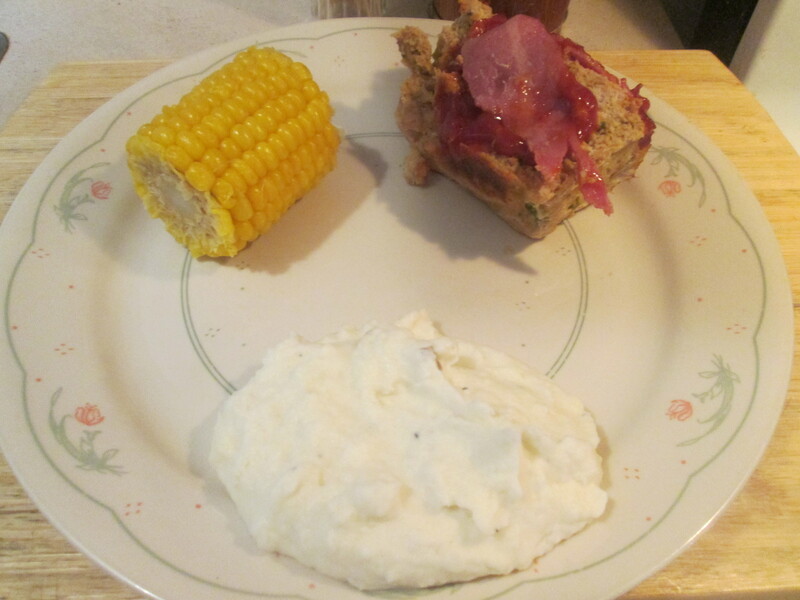 The Turkey Meatloaf was delicious before but with the added Bacon it gave it that much more flavor! I’ll add Turkey Bacon to it from now on! To go with the Meatloaf I prepared some more of the boiled Mini Corn Ears. I used Green Giant Mini Ears of Sweet Corn. They come frozen and all you do is boil them in water for about 12 minutes. Their 50 calories and 9 calories per mini ear. These are actually better than a lot of the fresh Corn on the cob I’ve had, nice job Green Giant! I also prepared Bob Evan’s Mashed Potatoes. You have to have Mashed Potatoes when you have Meatloaf, I think it’s an unwritten rule! One good comfort food dinner! For dessert later, just sticking with some fruit. A Banana and maybe a few slices of a Honey Crisp Apple. 5. Press meatloaf into an 8×4-inch loaf pan. Wrap 4 slices of Turkey Bacon over the top and down on to the sides of the meatloaf. 3 Tablespoons Heinz 57 Sauce, and stir to well mixed. Add as a topping for the meatloaf. Enjoy the succulent taste of corn on the cob year round! Available in a variety of sizes to fit your needs. Gorgeous day out today, 79 and sunny! Well while at Kroger early this morning shopping for some ingredients for the Potato Bacon Chowder I was going to prepare later for dinner I came across a new item, Boar’s Head Blackened Turkey. I asked the lady behind the counter if she had tried it and she said they had just put it in the Deli Case very early this morning. So she sliced us both off a piece to try it and its a winner! You taste the Blackened and there’s a nice hint of heat to it. I checked on Boar’s Head web site and it’s not even listed yet. So I ended getting a 1/3 of a pound for sandwiches. For dinner tonight, Blackened Turkey on Whole Grain w/ Potato Bacon Chowder. 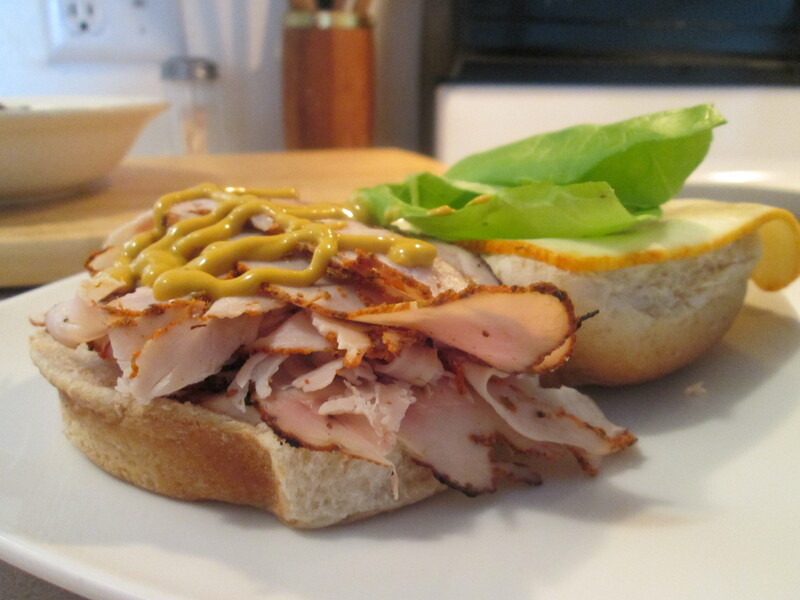 For the Sandwich I used the Boar’s Head Blackened Turkey, Hellman’s Light Mayo, French’s Yellow Mustard, Bibb Lettuce, a slice of Sargento Muenster Cheese, and Aunt Millie’s Light Whole Grain Bun. You have to try this Boar’s Head Blackened Turkey, it’s delicious! Now for the Chowder. 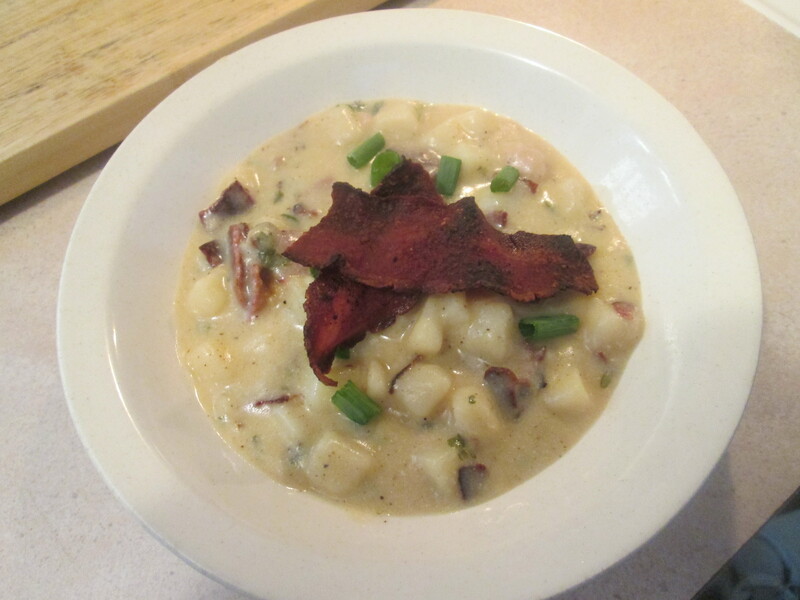 The Potato Bacon Chowder came from Mrs. City Boy. I’ve left the original recipe and her web link at the bottom of the post. Thank you Becky, great recipe! I made mine a bit different from the original recipe. I used Oscar Mayer Low Sodium Turkey Bacon, Green Onions, Del Monte Diced New Potatoes, Campbell’s Healthy Request Cream of Chicken, Daisy Reduced Fat Sour Cream, 2% White Milk, and Sea Salt, Ground Black Pepper, and Parsley for seasoning. I omitted the cup of chopped Onions and used Green Onions to give it that Onion taste. I’m just not real big on Onions. To prepare it fry the Turkey Bacon, add Green Onions and saute’ 2-3 minutes. Pour off fat. Add Diced Potatoes and Water. Bring to boil; cover and simmer 10-15 minutes until Potatoes are tender. Stir in Soup and Sour Cream. Gradually add Milk. Add Salt, Pepper and Parsley. Continue heating for a few minutes to allow flavors to mix. There you have it one nice Chowder! Fantastic flavor and it’s got good thickness to it, which I love thick Chowders, Chili and such. this would a good Clam Chowder also. Thank you again Becky! For dessert/snack later Thin Sliced Kahn’s Deluxe Bologna, sliced Cracker Barrel 2% Sharp Cheddar Cheese, and a serving of Ritz Whole Grain Crackers. Fry bacon, add onion and saute’ 2-3 minutes. Pour off fat. Add potatoes and water. Bring to boil; cover and simmer 10-15 minutes until potatoes are tender. Stir in soup and sour cream. Gradually add milk. Add salt, pepper and parsley. Continue heating for a few minutes to allow flavors to mix. When I cut my bacon I cut each slice into eighths, but it can be cut bigger or smaller depending on how much you like it dispersed into the soup. Since I used dried parsley, I used about 1 or 1-1/2 tablespoons rather than the whole 2 the recipe calls for, but again, it’s a matter of taste preference. Start the day off right with a delicious and healthy Spiced Bacon and Cheese Egg Muffin! Spray 2 10-inch nonstick skillets with nonstick cooking spray. 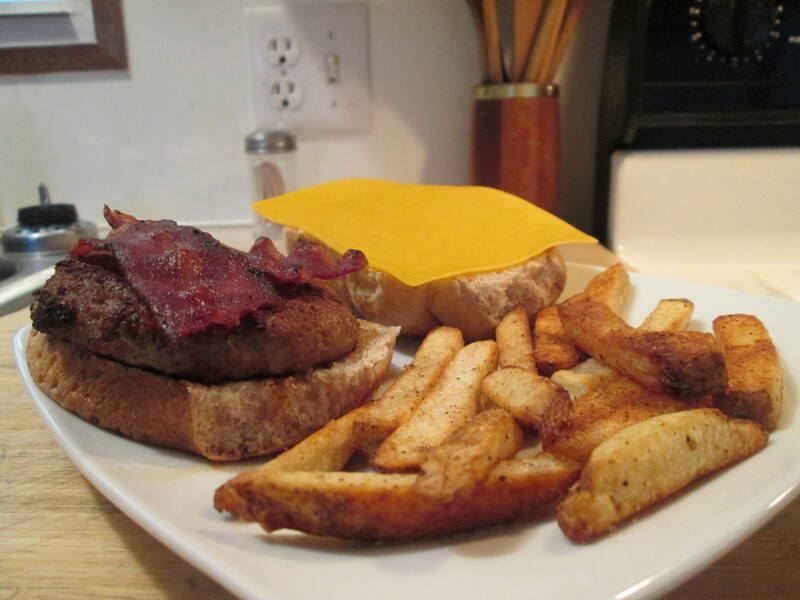 in one skillet fry Bacon as directed on package. For the Egg Beater’s heat over medium heat. Add Egg Beater’s and stir in hot pepper sauce, cilantro and Cinnamon. As eggs start to set, use spatula to lift edge, letting uncooked eggs flow to bottom of skillet. Cook until set but still moist. Sprinkle shredded cheese on top and then fold over the so cheese melts in the middle. Toast each half English muffin in toaster. Spoon about 1/2 cup Egg Beater’s mixture on top of two toasted muffins. Top each with one piece cooked bacon. Top with remaining toasted muffins. Lot of rain in the area today and in fact for the next 3 days their saying. 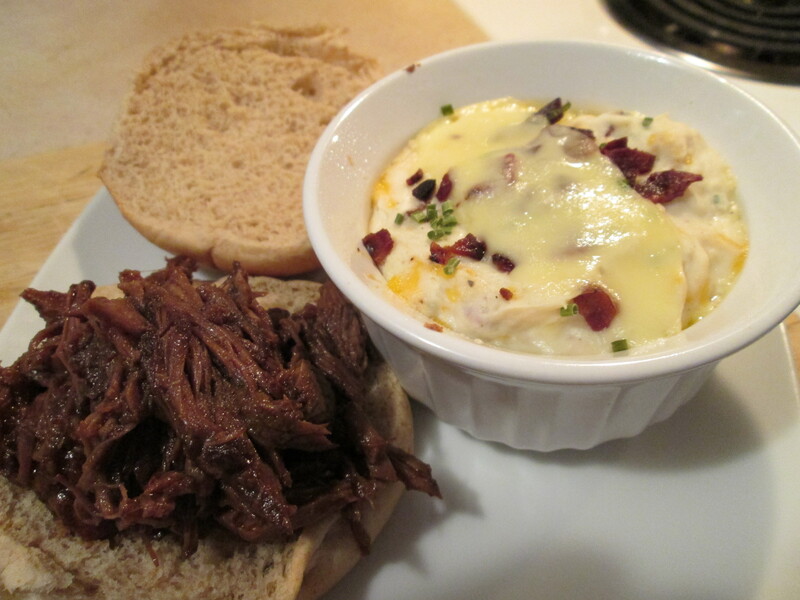 Wanted to come up with something new for dinner so I looked at some older recipes and scanned the internet and ended up deciding on Roast Beef BBQ Sandwich w/ Loaded Mashed Potato Casserole. I used Hormel Slow Simmered Beef Roast Au Jus. It comes in a microwavable container. Just heat on high for 5 minutes and it’s ready! It’s very tender and delicious. I shredded it with a fork and added JB’s Fat Boy Haugwaush BBQ Sauce to it. Great combo to make a BBQ Roast Beef with! The Beef is juicy & tender and the BBQ Sauce fills it with flavor. I served it on a Healthy Life Whole Grain Bun. For a side dish I prepared a Loaded Mashed Potato Casseroles. First time that I made these and won’t be the last! These turned out too good! I used Bob Evan’s Mashed Potatoes for the Potatoes. It’s loaded with Reduced Fat Philly Cream Cheese, Black Peppercorn, 2% Sharp Cheddar, Shredded Smoked Dutch Gouda Cheese, Turkey Bacon and Chives. All mixed together and baked and it comes out one delicious Potato dish! I left the full directions below. The directions will make 8 casseroles (ramekins). I made a 1/4 of the recipe that made 2 of them. These make a great Potato Dish, Mashed Potatoes with a kick! For dessert later a Blue Bunny Chocolate/Vanilla Swirl Frozen Yogurt Bar. 1) Heat oven to 375. Spray 8 (6 oz.) individual baking dishes (Ramekins) with cooking spray. Place dishes on a cookie sheet. 3) Bake uncovered 20 minutes or until thoroughly heated and Cheese is melted. Sprinkle casseroles evenly with remaining Chives, Bacon, and Gouda cheese. Let stand 5 minutes before serving. 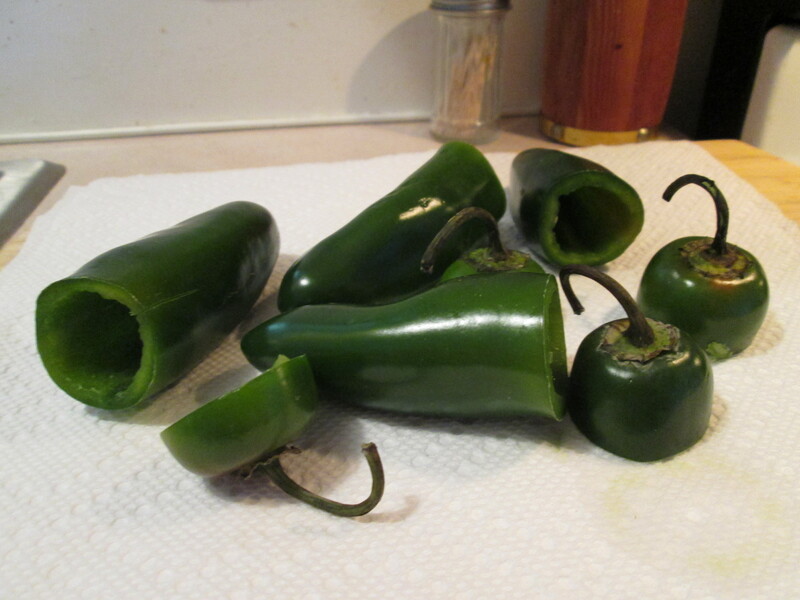 Still fighting a nasty sinus infection but the Stuffed Jalapenos helped somewhat to clear that up! 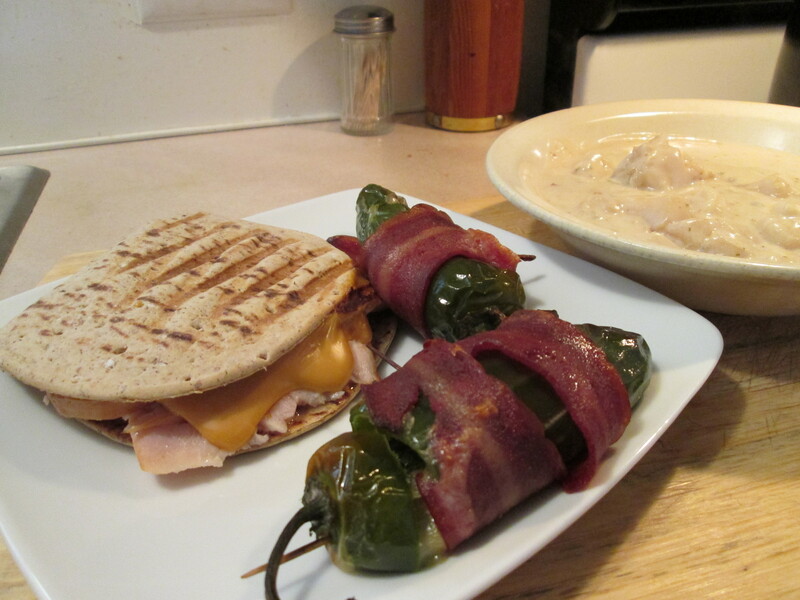 For dinner I prepared Turkey Breast Panini w/ Chunky Potato Soup and Bacon Wrapped Stuffed Jalapenos. 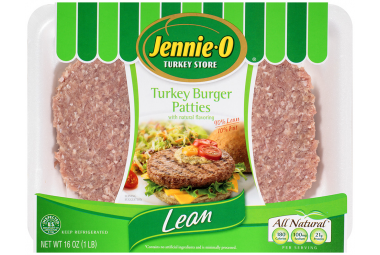 I used Jennie – O Extra Lean Turkey Breast/Hickory Smoked. It comes packaged as a half Turkey Breast and it’s 98% fat free and only 50 calories and 0 carbs! For the panini wrap I used Flatout Foildit Flatbread and it’s 100% Whole Wheat with Flax and it’s only 90 calories and 15 carbs. I then put the Turkey slices and a slice of Borden’s Smoked Cheddar on the Wrap and grilled it for 5 minutes in the Panini Grill. First time I used the Jennie – O Turkey Breast. It’s very tender and flavorful. Plus you can freeze the remaining breast to use later. Thank you Jennie – O! 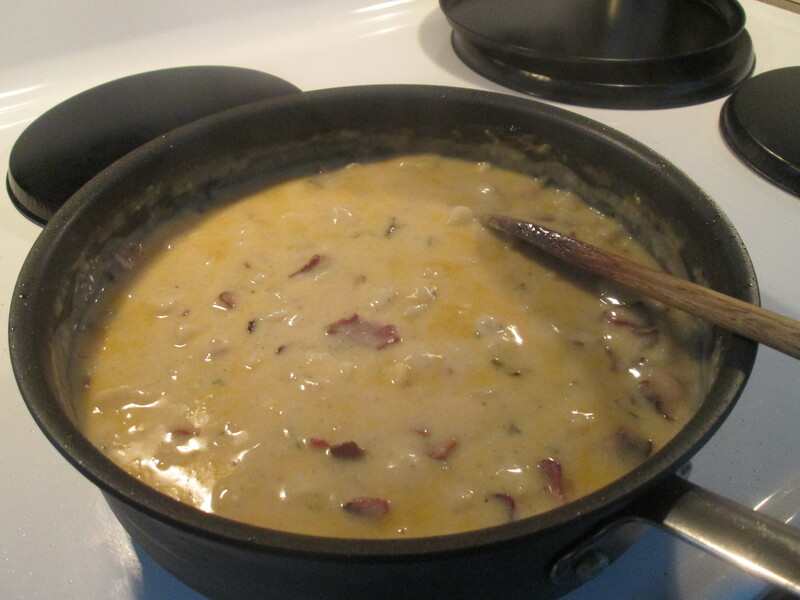 For sides I warmed up a can of Cambell’s Chunky Potato and Cheese & Bacon Bits Soup. A great tasting and thick soup. As Campbell’s says “It’s a soup that eats like a meal”. 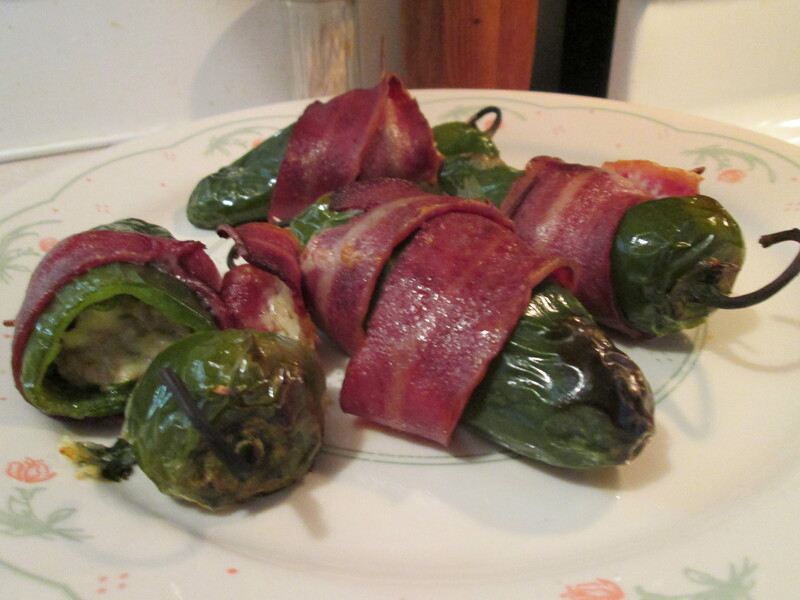 I also preapared a side of Bacon Wrapped Stuffed Jalapenos. Stuffed with chopped fresh Cilantro, fresh grated Dutch Smoked Gouda Cheese, and Ground Turkey. Then wrapped with Jennie – O Turkey Bacon and broiled in the oven for 20 minutes, turning once. These are fantastic!! The Jalapeno, Ground Turkey, Gouda cheese and Cilantro make an incredible flavor. The Jalapenos have a bit of heat but are also a bit sweet from roasting. Looking for a great appeitizer give these a try! I left the full recipe at the end of the post. For dessert/snack later while watching Monday Night Football a 100 Calorie Mini Bag of Jolly Time Pop Corn. 1)Preheat the broiler. Line a rimmed baking sheet with aluminum foil. 2) Brown Ground Turkey until no longer pink. Season with Sea Salt, Ground Pepper, Roasted Ground Cumin, and Parsley. 3) In a small bowl, mix together the Ground Turkey, Gouda Cheese and Cilantro. 4) Using a paring knife, cut off the top of the peppers and reserve. Scoop out the veins and the seeds, discarding both. Stuff the cheese mixture inside the peppers, packing it tightly. Replace the cap on each pepper, secure with a toothpick if needed. Wrap the slice of bacon, top to bottom, around each pepper, covering the cap, and secure with a toothpick. Put the peppers on the baking sheet. broil, turning occasionally, until the bacon is crisp and the peppers are tender, about 20 minutes total. Transfer to a serving platter and serve. It’s a rainy and gloomy day here in and around the Ohio Valley. Any picnics today will be on the inside. 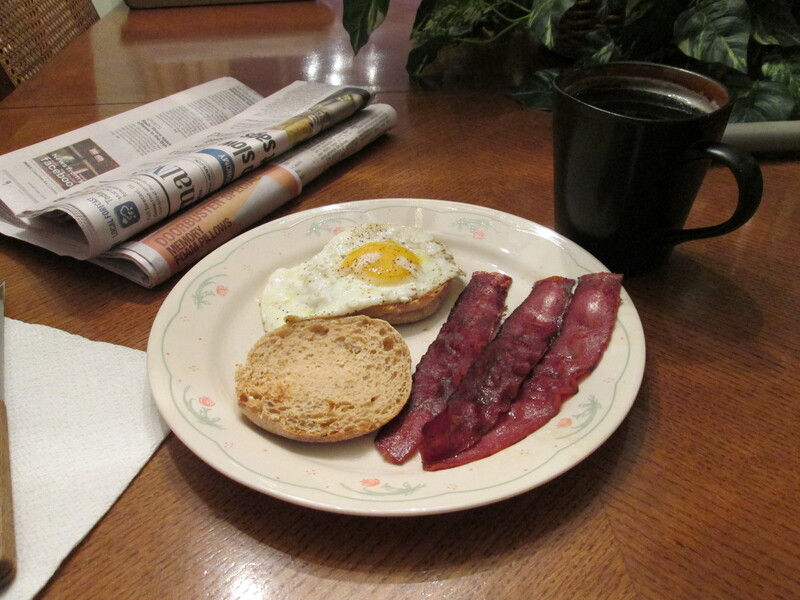 Started my day off with a toasted Healthy Life Whole Grain English Muffin topped with an Egg Sunnyside Up and side of the New and Improved (and it is) Jennie – O Turkey Bacon. Also had a cup of steaming hot Bigelow Green Tea along with the morning papers. Rainy on the outside and cozy on the inside! Happy Labor Day All!